Significance: Although excessive and prolonged exposure to cold may be an infrequent problem in high school athletics, the prevention, recognition and management of cold-related conditions are still an important consideration for coaches, administrators and athletic trainers. The human body's mechanisms of heat retention are significantly less efficient than our ability to dissipate heat. Epidemiological research suggests that even in otherwise innocuous environmental conditions, hypothermia can occur. During the day, the temperature may be moderate and the sun shining, but as the sun sets and the temperature begins to fall, when coupled with conditions of exhaustion, dehydration and wet clothing associated with physical activity, the risk of cold-related pathology can increase. Vasoconstriction - Decreases blood flow to the periphery to prevent loss of body heat. Shivering - While involuntary shivering generates heat through increased muscle activity, it may also hinder an athlete's sport performance and ability to perform behavioral tasks to aid in heat retention. Activity increase - Increases heat production through a general increase in metabolic activity. Quick bouts of intense activity can generate incredible amounts of heat. Behavioral responses - Adjusting the number and type of clothing layers will result in heat regulation by controlling the amount of heat lost by the body. There are two cold-related pathologies that coaches, administrators and athletes should be aware of: hypothermia and frostbite. Hypothermia is defined as a decrease in the core body temperature to at least 95 degrees F. It occurs when the heat loss is greater than the metabolic and heat production. Hypothermia can be categorized in three stages: mild, moderate and severe, based on core body temperature. Frostbite is a thermal injury to the skin, which can result from prolonged exposure to moderate cold or brief exposure to extreme cold. The body areas most prone to frostbite are the hands, feet, nose, ears and cheeks. Frostbite can be classified into three basic categories: frostnip, superficial frostbite and deep frostbite. There are several factors influencing one's susceptibility or risk of cold related injury or illness. These factors can be additive. Thus, it is essential to appreciate each of these factors, along with the associated signs and symptoms of hypothermia and frostbite. For example, exposure to 30 degrees - 50 degrees temperature under wet and windy conditions can be equivalent to sub-zero temperatures with no wind or moisture (see the Wind Chill Index chart at the bottom of this page). Low air temperature - When cold exposure exceeds or overwhelms the body's ability to compensate for heat loss due to the external environment. 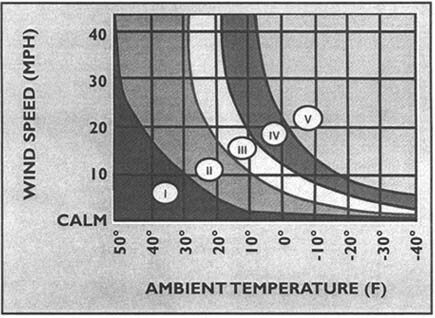 Wind chill - Figure 1 provides a wind-chill index chart that identifies the risks associated with the interaction of the wind speed and air temperatures. Moisture - Wet skin freezes at a higher temperature than dry skin. Exposed skin - Heat loss occurs primarily through convection and radiation to the external environment, but may also include evaporation if the skin is moist. This is a concern for those exercising and sweating in cold environments. Insulation - The amount of insulation from cold and moisture significantly affects thermoregulation. Dehydration - Negatively influences metabolism and thermoregulation. Alcohol - Increases peripheral blood flow and heat loss; can also disrupt the shivering mechanism. Tobacco - Acts as a vasoconstrictor; increasing the risk of frostbite. Hypothermia is a decrease in core body temperature. Mild Hypothermia - shivering, cold sensation, goose bumps, numb hands. Moderate Hypothermia - intense shivering, muscle incoordination, slow and labored movements, mild confusion, difficulty speaking, signs of depression, withdrawn. Severe Hypothermia - shivering stops, exposed skin is bluish and puffy, inability to walk, poor muscle coordination, muscle rigidity, decrease in pulse and respiration rate, unconsciousness. 97 - 95 F Cold sensation, goose bumps, unable to perform complex tasks with hands, shiver can be mild to severe, hands numb. Moderate Hypothermia 95 - 93 F Intense shivering, muscle in-coordination becomes apparent, movements slow and labored, stumbling pace, mild confusion, may appear alert. 93 - 90 F Violent shivering persist, difficulty speaking, sluggish thinking, amnesia starts to appear, gross muscle movements sluggish, unable to use hands, stumbles frequently, signs of depression, withdrawn. Severe Hypothermia 90 - 86 F Shivering stops, exposed skin blue or puffy, muscle coordination very poor, inability to walk, confusion, incoherent/irrational behavior, but may be able to maintain posture and appearance of awareness. 86 - 82 F Muscle rigidity, semiconscious, stupor, loss of awareness of others, pulse and respiration rate decrease, possible heart fibrillation. 82 - 78 F Unconscious, heart beat and respiration erratic, pulse may not be palpable. 78 - 75 F Pulmonary edema, cardiac and respiratory failure, death. Death may occur before this temperature is reached. The basic principles of rewarming victims of hypothermia are to conserve the heat they have, and replace the heat that they have already lost. The best method to determine the extent of core temperature loss is measurement of rectal temperature. Unfortunately, obtaining a rectal temperature reading on a moderately or severely hypothermic patient can be difficult, and may expose the athlete to further cooling. Remove athlete from cold environment. Remove wet clothing and replace with dry clothing and/or blankets. Refer all moderate cases to the emergency room once safe to transport. Treat severe hypothermia as a medical emergency! Wrap the athlete in an insulated blanket and see emergency medical care immediately. Details: The following describes the management regimes for hypothermia relative to severity. Mild hypothermia - Seek dry shelter; replace wet clothing, insulate whole body and head, avoid sweating, use external warmth (bath, fire) only if core above 95 degrees F, give warm sweet drinks and food. Moderate hypothermia - Avoid exercise and external warmth, gently rest, give warm sweet drinks and calories, internal warming via warm moist air, monitor pulse and breathing. Severe hypothermia - Medical emergency, give nothing by mouth, wrap in an insulated blanket, avoid rapid rewarming, transfer to hospital immediately. Thermal injury to the skin caused by cold exposure. Frostnip Only the outer layer of skin is frozen. Skin appears white and waxy or possibly gray or mottled. It may have sensation or may be numb. May be painful. Superficial Frostbite Skin appears white, mottled or gray. It feels hard or rubbery on the surface, but deeper tissue is still soft. Skin is insensitive to touch. It is very important to note that refreezing newly thawed frostbitten tissue can cause extensive tissue damage. If it is not absolutely certain that the tissue will stay warm after rewarming, do not rewarm it. Once the tissue is frozen, the major harm has been done. Keeping it frozen for a longer period of time will not cause significant additional damage. Gently rewarm the area by blowing warm air onto the area, placing the area against a warm body part, or placing the affected area into warm (101 - 108 degrees F) water for several minutes. If not absolutely certain that the tissue will stay warm after rewarming, do not rewarm it. Refreezing newly thawed frostbitten tissue can cause extensive tissue damage! If a person is also suffering from hypothermia, the first concern is core rewarming. Details: The following describes the management of frostbite relative to severity. Frostnip - Rewarm the area gently by blowing warm air onto the area or placing it against a warm body part or place in a warm (101 degrees - 108 degrees F) water bath for several minutes. Never rub the area. This can damage the affected tissue by increasing the friction on the ice crystals in the cell, causing tearing of the tissue. Superficial frostbite - If a small area is involved, it can be treated the same as indicated for frostnip; if it is a larger area, follow the management for deep frostbite. Deep frostbite - Rewarm by removing restrictive clothing and immersing the affected body part in a water bath of 105 degrees - 110 degrees F for 25-40 minutes. Refer deeply frostbitten athletes to the emergency room. Do not rewarm the tissue unless absolutely certain that it will stay warm after rewarming. The best method of management is prevention. Cover the head to prevent excessive heat loss from the head and neck. Stay dry by wearing a wicking fabric next to the body and a breathable, water repellent outer layer. Avoid alcohol, caffeine and nicotine. Educate participants, coaches, officials and administrators in recognition of cold-related illnesses. Consider cancellation of athletic events if weather conditions warrant. If unsure whether an athlete is hypothermic, err on the side of caution and treat accordingly.